Show Your “Love For Mother Earth” through Your Photos! Photos, whether taken by a cameras or a smartphones, can make an impact through its visual message and how it can affect our feeling. As they say, “a picture paints a thousand words“! So take this chance to show off your #photography skills and love for Mother Earth at the same time through the “Juan Earth Photo Contest“! 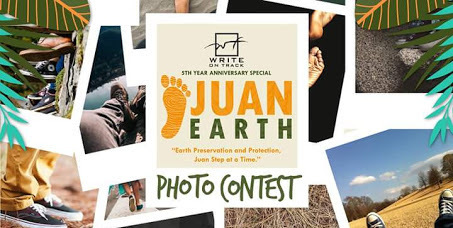 Join the #JuanEarth photo contest and take a shot towards environment preservation and animal protection in the Philippines! 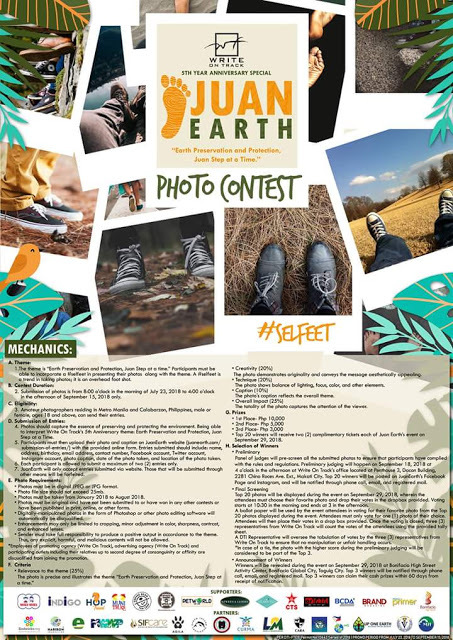 With the theme “Earth Preservation and Protection, Juan Step at a time”, participants must be able to incorporate a “selfeet” in presenting their photos along with the theme. A “selfeet” is a trend in taking photos; it is an overhead foot shot. Amateur photographers, 18 and above, residing in the Metro Manila and Calabarzon, Philippines, can send their entries. Submission of photos are accepted until the 4pm of September 15, 2018. The grand prize winner will bring home Php 10,000 in cash, followed by Php 5,000 and Php 3,000 for the 2nd and 3rd prize winners. The top 20 winners will also receive two (2) complimentary tickets each of Juan Earth’s event on September 29, 2018 as elaborated below. Juan Earth is a grassroots effort produced by Write On Track and its dedicated team of community volunteers that is interconnected and expanding as a network throughout neighborhoods, cities, and regions. They aim to educate and empower people to create a healthier, and more sustainable world through thier various meaningful activities. In connection with this, Juan Earth will also be holding an event on September 29, 2018 at Bonifacio High Street Activity Center, 9th Avenue, Bonifacio Global City, Taguig City. They will feature performances by Silent Sanctuary, FEU-IAS DANCE COMPANY, PUP Teatro, Komunikado Officiala and UST Salinggawi Dance Troupe. It will be hosted by Stephanie Ongkiko and Rica Garcia of Monster Radio RX 93.1. Discover more about life and style from Blogger Manila through email subscription here. Like our Facebook Page, Twitter @BloggerManila, and on Instagram. Join now and know more about the Juan Earth Photo Contest on their website www.juanearth.com for contest mechanics and other details (per DTI-FTEB Permit No.13643 Series of 2018). Blogger Manila will surely join in for our love for Mother Earth! See you!